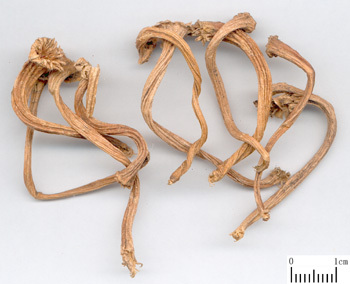 The dried pedicel of the annual herbaceous trailing plant Cucumis melo L. of the family Cucurbitaceae. Cultivated in most area in China. Pluck the pedicel before it matures in summer. Dry, yellow, pedicel with a little stalk. Unprocessed or stir-baked to yellow. Bitter, cold, toxic, stomach and spleen meridian entered. Induce vomiting, dispel dampness to treat jaundice. It is a common used emetic herb because of its strong action of promoting vomiting. It is indicated for all the diseases which should be vomited. For epilepsy, mania, inflammation of throat and dyspnea due to phlegm-fire accumulated in chest, it could be smashed into powder and taken. For retained food stayed inside, distending pain in abdomen and stomach, it is combined with Chi Xiao Dou, Dou Chi in the formuia Gua Di San from Shang Han Lun. For poisoned by arsenic, it is decocted with Gan Cao, Xuan Shen and Di Yu to promote vomiting from Bian Zheng Lu. It can drain damp-heat to treat jaundice and it is indicated for jaundice of damp-heat type, both taking orally and puffing through nose are effective ways. For jaundice of damp-heat type, it could be applied singly, such as it is smashed into powder to puffy in nose, then some yellow-discharge flows out from nose, which means the damp-heat drained from it and the jaundice would be treated; or it is decocted singly, such as in the formula Yi Wu Gua Di Tang from Jin Kui Yao Lue. Decoct 2.5~5 g, 0.3~1 g for pill or powder, an appropriate dosage for external usage. Puff through nose, which should be stopped when yellow-discharge flows out.